A young woman blessed with visions, Yim, is on a journey to serve the goddess Karm when her wagon is attacked. She is made a slave and sold for 10 coppers to Honus, a Sarf, whose sole duty is to serve his holy Bearer. Honus’s Bearer was killed by the followers of the evil god, the Devourer. Before his Bearer died, he told Honus to never carry his own pack and this leads Honus into a town of thieves where he purchases a slave. Honus and Yim begin the long journey of getting Honus a new Bearer at Karm’s temple. During the trip evil rears its head and the two soon find their lives touching in ways other than master-slave. In ways reminiscent of his Orc Queen trilogy, Morgan Howell creates a complex world that is black and white or good vs. evil in his newest book. 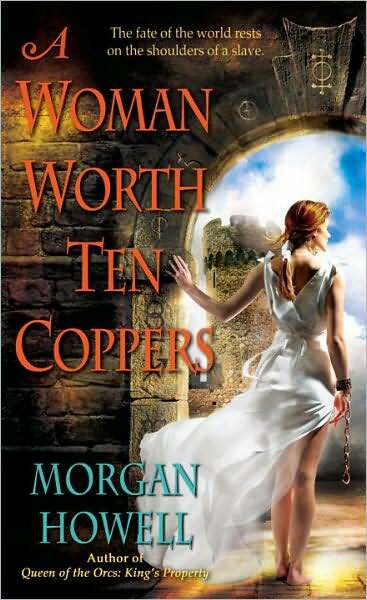 An epic fantasy, A Woman Worth 10 Coppers is book one in the Shadowed Path trilogy. It has two main groups of people: those who follow the goddess of light (Karm) and those who follow the god of darkness (Destroyer). People who choose darkness live on fear, death and pain. They gleefully do horrible things, thinking only of themselves and fulfilling their own wants. This world is set in the same land as Orc’s, but two centuries later, according to Morgan Howell. The dark ones take from the weak and horde it. The followers of light are retreating, in hiding, or in danger from the darkness thriving in humanity. They need hope and they just might find it in Yim and Honus. Yim sees the trauma the land and people around her have suffered and is overwhelmed by it, at times regretting her ability to see it. She hates being a slave, but the use of foreshadowing makes it clear that she will travel a hard path on a road that might lead to the world’s salvation. Seeing the dregs of humanity with no impulse control, the oily evil infiltrating the world and two people learning to trust each other is great material. The way the material is pulled together and woven into an intricate piece of art is what makes A Woman Worth 10 Coppers a great story.